The Best Teeth Whitener - Which One? I think SNOW is one of the best teeth whitener systems for home use. You get dentist-quality whitening gels, resulting in safe and reliable tooth whitening, but SNOW is WAY CHEAPER than the cost of getting a kit directly from a dental office. BUT you have to do nearly all of the work yourself, at home. Essentially, you can cut out the "middle man" (the dentist), and save money while still getting good results. It may seem strange for me, as a dentist, to be recommending a product that doesn't need a dentist! But I believe in "telling it straight", and I have found that SNOW offers a system that is simple to use, is safe, and gives whitening results that are as good as most other products. It may not be the best teeth whitener if you want very quick whitening, or you want full-on Hollywood "bling" white; but I think the price easily makes it a winner. 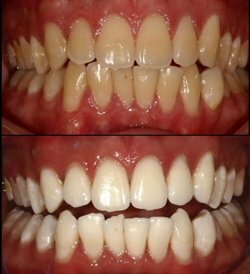 To understand why I think SNOW teeth whitening deserves to be considered be the best teeth whitener for home use, we need to take a quick look at why dentist-supplied products work so well, and why over-the-counter teeth whitening gels from a pharmacy or other store just don't work well at all. Here we go. There are really just TWO things that affect how well tooth whitening works. One of them is the formula for the actual teeth whitening gel - how strong is it? Does it lose it's strength if it's left on the shelf for long? And will it make your teeth sensitive? The other one is HOW the gel is applied to the teeth. Is it protected from saliva? Can it leak out, away from the tooth surfaces? The dentist-supplied products have both areas covered; they use custom-made splints or trays that fit over your teeth very accurately. They get a great seal at the gum edges, all the way round. This concentrates the gel right where you want it for best effect. And because they fit so well, they prevent saliva getting in, diluting the gel, AND they prevent any gel from leaking out and getting on your gums. This also means that the gel can be stronger, so you get more whitening. In addition, the gels from a dental office will have a longer shelf-life, and have a lower risk of tooth sensitivity. On the other hand, the pharmacy-supplied "boil and bite" kits that you can buy over the counter do NOT fit anywhere near as accurately as the dentist-supplied splints. They do not have a good seal at the edges. They can leak. This means that over-the-counter whitening gels have to be weaker, because they are going to leak out. AND saliva can leak in under the splint, diluting any gel that does remain. SNOW is a clever system that takes the advantages of some aspects of dentist-supplied systems, but without a dentist. If you take the dentist out of the mix, you are also cutting out the "middle man". You deal direct with the manufacturer. And that is how it works out to be much less expensive. There are no dentist fees to pay! I think that this combination of "dentist quality whitening" combined with low prices puts SNOW up there with other whitening products for the title "best teeth whitener". First, you have to go to the SNOW website. Have a look at the system, and read the reviews. Then you can place your order right there. A few days later, you will receive a package from SNOW. This contains the materials you need to make the thermoplastic splints over your own teeth.The system is easy to use, and comes with full, easy-to-follow instructions. I think it is well-explained. It is very important to make sure that the thermoplastic splints fit tightly. First of all, the water must be hot enough. Second, when you put the plastic over your teeth, BE SURE to PRESS TIGHTLY at the gum edges. You want the splints to fit VERY tightly over your gums. The SNOW system uses 35% carbamide peroxide gel as the whitening agent. You can read more about this HERE. My recommendation is to leave the gel in place on your teeth for AT LEAST 20 - 30 minutes instead of the recommended 15 minutes. AND you can do another application straightaway, "back-to-back". This will speed up the whitening process. MY FINAL TIP is to brush your teeth carefully before applying the whitening gel. UNLESS you are having a problem with sensitivity. In this case, DO NOT brush and floss just before whitening. The whitening results will be almost as good, but without sensitivity. However, I have not found sensitivity to be a problem with the SNOW teeth whitener system. If you DO get sensitivity, take a look at my Tooth Whitening Sensitivity page for tips on how to stop this problem. Over about 10 to 15 days, your teeth will gradually become whiter. One of the things I like about home teeth whitening is that you are in full control. You can start and stop the whitening treatment anytime you want. Keep the whitening trays safe and away from any heat sources. After 12 months or so you may notice a slight loss of whiteness from your teeth. Just get out your gel and trays again - usually 1 or 2 applications will get your whiteness back to where you want it! The best teeth whitener? If you're willing to do most of the work yourself at home, I think it's worth checking out SNOW. There ARE other whitening systems that work almost as well (or maybe slightly faster OR get a tad more whitening), but they are much more expensive. To find out about alternatives, visit Best Teeth Whitening Products. Get a GOOD-QUALITY electric toothbrush. 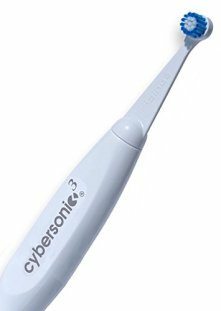 But don't get just any electric toothbrush - GET MY TOP-RATED BRUSH, THE CYBERSONIC 3. If you use my special DISCOUNT CODE you can get the Cybersonic3 at around HALF PRICE - that's just $50 !